Blues fans will have a second chance to see their side in home pre-season action tonight, as former popular City midfielder Roberto Martinez (left) brings his Championship squad Swansea City to Deva Stadium. With the start of the new League campaign just over a week away City manager Simon Davies has three players unlikely to play tonight through injury. The trio, Paul Linwood Anthony Barry and James Vaughan, and not expected to be risked. In an effort to boost the attandance tonight the club will have three prizes on offer. The 500th paying Blues supporter will win two stand tickets for the forthcoming Carling Cup first round match against Leeds United. The 750th supporter through the turnstile will be presented with a signed shirt and ball. And the 1,000th paying fan will win a season ticket for the forthcoming season at the Deva Stadium. Admission prices for tonight’s game are £10.00 for adults, £6.00 for concessions. John Murphy is to discuss personal terms today with Eircom League of Ireland club St Patrick’s Athletic after Chester and the Dublin-based side agreed a fee for the striker. Murphy has made 116+44 appearances in two spells with Chester, scoring 30 goals. Should Murphy decide his future lies elsewhere manager Simon Davies may again look at the option of Trevor Benjamin who had a trial with the club last week before an eye infection forced him to miss the Carlisle match. Striker Chris Holroyd has had his contract at Chester terminated my mutual consent and is now effectively a free agent. Holroyd has attracted interest from Cambridge United and Morecambe and on Monday turned down a week long trial at Bournemouth. The club have agreed a two year deal with French midfielder Damien Mozika. The former AS Nancy player has impressed manager Simon Davies during his spell on trial with the club and turned in a good performance in the pre-season friendly against Carlisle United. Three players have had their CVs circulated to all League One, League Two and Blue Square Premier clubs after being told they don’t feature in future plans. They are striker Chris Holroyd and midfielder’s Mark Hughes and Paul Rutherford. Rutherford is currently on a weeks trial at Bournemouth while Holroyd turned down an offer from the same club on Monday, he has also attracted interest from Cambridge United. Hughes has also been linked with another League Two side Barnet, though the midfielder rejected personal terms offered by the Underhill side this week. Two late goals through defensive errors robbed City of a draw they deserved after an encouraging performance against their League one opponents Carlisle United. The visitors took the lead on 37 minutes after a fine finish from Scott Dobie. The Blues wasted little time in scoring the equaliser with Kevin Ellison blasting home a free-kick just two minutes later. City had had the better of the opening half with French trialist Damien Mozika (left) making his long awaited first appearance and impressing after a fine show. Another new signing, Anthony Barry, also put in good performance. Manager Simon Davies made five changes after the break and City lost their rhythm to allow the visitors to get on top. The Cumbrians took the lead eight minutes from time through Gary Madine and sealed the game four minutes later as Simon Hackney took advantage of some hesitation between John Danby and Paul Butler to score with ease. Chester City: Danby, Roberts, Wilson (McManus 73), Dinning (S.Vaughan 60), Linwood, Butler, Mozika, Barry (Hughes 60), Murphy (Taylor 66), Partridge (Lowe 46), Ellison. Simon Davies’ weekly video interview with the Evening Leader can be viewed here. If you would like to ask Simon Davies a question in the weekly Chester Standard/ Leader video interview email them to digitalnews@nwn.co.uk. As many of your questions will be put to the Chester City manager as possible. Please include your name and general area that you are from. Midfielder Paul Rutherford has joined fellow League Two side Bournemouth for a week long trial today. He was supposed to have been joined by Chris Holroyd, who has already been the subject of a possible move to Cambridge United in recent weeks, but the striker decided not to travel south at the last minute. The club have finally received full international clearance for French trialist Damien Mozika and the 22-year-old midfielder will start in tomorrow night’s friendly against Carlisle United. Tomorrow’s match at Deva Stadium will kick-off at 19:45hrs. Admission prices are £10 for adults and £5 for concessions. A penalty from Tony Dinning and a first senior goal from Stephen Vaughan brought City a 2-1 win at Rivacre Park this afternoon. As expected the Blues gave a trial to striker Trevor Benjamin and had another look at goalkeeper Chris Senna. Chester City (first half): Danby, Rule, Kelly, Butler, Roberts, S.Vaughan, Dinning, Mannix, Ellison, Partridge, Benjamin. Chester City (second half): Sanna, Wilson, Roberts, Linwood, Barry, Mitchell, Mannix, McManus, Lowe, Benjamin (Kelly), Murphy. Chester continue their pre-season fixtures tomorrow with a game at Vauxhall Motors (15:00hrs). The Blues will probably be without five players as although John Murphy, Anthony Barry and Shaun Kelly returned to training yesterday they may well not be risked at Rivacre Park. Striker Paul Taylor, who is on loan from the Motormen, and Jay Harris are both expected to be ruled out through injury. French trialist Damien Mozika is also expected to miss the game as final details regarding his registration have to be cleared. Admission prices for tomorrow’s game are £6.00 for adults, £4.00 for concessions and £2.00 for juniors. City are keeping tabs on 29-year-old striker Trevor Benjamin. 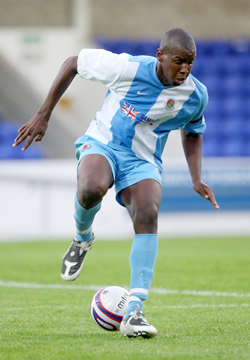 Since starting out as a trainee at Cambridge United in 1995 the much-travelled striker has made appearances (mainly on loan) for Leiester City, Crystal Palace, Norwich City, West Bromwich Albion, Gillingham, Rushden & Diamonds, Brighton & Hove Albion, Northampton Town, Coventry City, Peterborough United, Watford, Swindon Town, Boston United, Walsall and Hereford United who he played for last season. Benjamin is now a free agent and has attracted interest from Simon Davies. The club will continue to monitor his situation. In a move that has surprised all City fans, ex-club director and major sponsor for the last three years Paul Baker has joined the board as a Director at AFC Bournemouth. Baker has teamed up with with marketing firm Sport-6, to take over at the Hampshire club after having an offer to buy Chester turned down last year by club owner Steve Vaughan. As a result of the takeover Bournemouth are now expected to come out of administration. Baker, along with his business partner Alistair Saverimutto, have announced a seven figure investment and will unveil a ground breaking three-year shirt sponsorship deal and new kit on Monday. Goals from Laurence Wilson (left) and Paul McManus gave Chester a goal lead at Southport last night but the Blues had to be content with a share of the spoils after the Sandgrounders fought back through second half goals from Tony Gray and Michael Powell. Earlier the home side had missed a first half penalty. This was the first real run out for Simon Davies’ senior squad this season, only two players Glenn Rule and Wilson played the full 90 minutes, with the rest of the starting X1 being changed at the interval. Chester City (first half): Chris Sanna, J.Vaughan, Wilson, Dinning, Linwood, Partridge, Roberts, Mitchell, Lowe, Rule, Conal Rowlinson. Chester City (second half): Danby, Rule, Butler, Platt, Wilson, Mannix, S.Vaughan, Hughes, McManus, Ellison, Rutherford. One of the clubs best known supporters Hugh Lloyd has died at the age of 85. Hugh was born in 1923 and brought up in Chester. After leaving the Kings School he joined the Chester Chronicle as a cub reporter reviewing local theatre performances for two years. He always had aspirations of becoming a comedian though and at the outbreak of World War Two joined ENSA (the Entertainments National Service Association) where he toured throughout the world appearing in variety performances. He returned from the war to embark on a career on the stage and found himself performing at the Windmill Theatre in London. His big break came when he was given a small part in the popular radio show Hancock's Half Hour in 1954, and two years later was given a larger role when the programme was screened on television and he wen on to feature in 25 episodes of the popular show. In the early 1960 hugh teamed up with another friend Terry Scott as he starred in his own TV show Hugh and I which ran for 69 episodes over several years and The Gnomes of Dulwich, again with Scott. Despite a busy schedule Lloyd always made sure he was up to date with news from the football club and would often have the scores relayed to him on stage. He also used to meet up with Terry Scott at the Recreation Ground whenever Chester played Aldershot and was often seen at Brighton whenever the Blues played at the Goldstone Ground. Although he will be best know for his comical roles in the 1960s he went on to make countless appearances in TV shows including: Dr Who (1987), Boon (1991), Cider with Rosie (1998) and Great Expectations (1999) as well as many theatrical performances in the West End. Hugh made several trips to Deva Stadium over recent years and in April 2002 held a book signing in the club shop with the publication of his autobiography ‘Thank God For A Funny Face’. Lloyd was appointed the MBE in 2006 for services to drama and charity. The Blues begin their pre-season matches tonight with a trip to Blue Square North side Southport. Manager Simon Davies will field a mixed team of first team and youth players as he takes a first real look at his 2008/09 squad. Two of his summer signings Jay Harris and Anthony Barry are already ruled out through injury while Shaun Kelly is also sidelined with a hamstring injury. Two trialists, out to earn a contract for next season, will also feature but French player Damien Mozika is still awaiting international clearance and it may have to be Saturday’s match at Vauxhall Motors before City fans can see him in action. Tonight’s game at Haig Avenue will kick-off at 19:45hrs and admission prices are: £8.00 adults and £5.00 concessions to all parts of the ground. The new club shop in Watergate Street is due to open on Monday. Supporters will be able to buy City merchandise and memorabilia as well as tickets for future games without the long trek out of town to Deva Stadium. The shop is run in conjunction with Gazelle Sports. The shop opening hours are 10:00-16:00. French midfielder Damien Mozika has had his pre-season trial extended after impressing manager Simon Davies in training. He played in France last season for AS Nancy Lorraine. Provided international clearance is gained, Mozika is expected to feature in next weeks friendlies against Southport and Vauxhall Motors. Tickets for Chester’s televised home Carling Cup first round game against Leeds United on Tuesday 12 August are on sale to season ticket holders today from 10:00-19:00hrs. To keep their reserved seat (held until Wednesday) season ticket holders should take along their book, or if they have not received that yet, receipt of purchase or proof of identity. The whole of the West stand, as well as the usual seats behind the goal, has been given to Leeds United. Tickets will go on general sale at the ticket office tomorrow, 12 July, from 10:00-12:00hrs, and all next week from 10:00-16:00hrs. The cost of the tickets are £15.00 for adults and £10.00 for concessions and U16s. A Chester City X1 were beaten 3-1 at the New Saints in a friendly match played behind closed doors this afternoon at Park Hall. The City side was comprised mainly of young pros, reserves and youth team players. Andy Mitchell scored the goal for City. Striker Chris Holroyd looks set to join Blue Square Premier side Cambridge United. Holroyd scored five goals in 21+31 appearances from City. Holroyd joined Chester as a trainee from Crewe Alexandra but was unable to maintain a regular first team place and missed the latter part of last season through injury. Both clubs have agreed a financial offer and now the player is set to discuss personal terms with U’s manager, and ex-City player, Gary Brabin. Meanwhile another player who could be on the move is midfielder Mark Hughes who has been attracting interest from Barnet. Former player Ryan Lowe has re-signed at Chester on a reported two year deal. He is the fifth signing of the summer and rejoins the Deva outfit two years after leaving following a falling out with then manager Mark Wright. Lowe first signed for City from Shrewsbury Town on 22 March 2005 and went on to make 38+4 appearances, scoring 17 goals, two of which were on his home debut against Bury. In a surprise move yesterday both Paul Butler and Tony Dinning penned new one year contracts after settling their well publicised dispute with the club. Chester have finally completed the signing of Vauxhall Motors 20-year-old striker Paul Taylor on a six month loan deal. The switch should become permanent during January transfer window. The club bid £50,000 for the ex-Manchester City trainee in the January transfer window which was turned down at the time. City made a fresh five figure bid at the end of the season and although the two clubs agreed the deal the player was still to agree personal terms. Taylor scored 17 goals for the Motormen last season. City will play Vauxhall Motors in a pre-season friendly at Rivacre Park on Saturday 19 July, kick-off 15:00hrs. LOWE SET FOR DEVA RETURN? The 29-year-old still has a year to run on his contract at Gresty Road and made 4+0 appearances in a loan spell with Stockport County towards the end of last season. Lowe left Chester two years ago and has scored 17 goals in 57+17 matches for the Railwaymen.